Five things to look for as No. 10 Penn State opens the season against an Appalachian State team that will be overmatched but won’t be intimidated coming in to play on such a big stage. In the best-case scenario, Penn State will grab a big early lead and control throughout, allowing the coaching staff to get a whole bunch of younger players some valuable experience. With a road game at Pitt on the horizon next week, the Nittany Lions want to get young linebackers Micah Parsons and Jesse Luketa, as well as the backup defensive tackles and young receivers, as many snaps as possible today. Those players will be counted on as the season progresses, and it would be good if the coaches can find out what they have and who they might be able to rely on when things get more difficult next week. If today’s game is closer than expected in, say, the third quarter, it might prevent the coaches from being able to take a long look at several youngsters. Here’s a familiar strategy: Load up the box on defense to shut down the other team’s star running back and force the quarterback to beat you. Teams did that just about every week the past two years against PSU and Saquon Barkley, and today the Lions will be employing that game plan. App State has an excellent running back in senior Jalin Moore, who’s projected to be a mid-round NFL draft pick next year. The 5-foot-11, 210-pound senior is strong and fast (4.37 in 40-yard dash), and he’s the only active FBS running back with four career games of at least 235 rushing yards. But App State has a new and unproven starting quarterback in Zac Thomas, so it’s a no-brainer the Lions will sell out to slow down Moore and see if Thomas can do anything to hurt them. If Thomas can complete some passes and move the chains through the air, then the Mountaineers might have a chance to stay within striking distance. But if Thomas struggles, Moore won’t have much room to run. There’s no reason that PSU should struggle on either line in this game. If it does, that would be cause for concern. App State’s offensive line averages just 283 pounds, compared to 320 for Penn State’s O-line. The Lions have to figure out their depth issues at defensive tackle and middle linebacker — positions that are counted on to help stop the run — but you have to figure this is a good opening matchup in that regard facing such a small offensive line. We’ve heard for months how much better PSU’s O-line will be this season. But we’ve heard that the past few years, as well, only to see the group disappoint. This should be the year, though, that the O-line takes a major step forward. Miles Sanders has been waiting for his opportunity for two years, sitting behind the all-world Barkley, and today it finally comes. Sanders has a chance to be a tremendous running back for PSU, not only because of his own skills, but also because PSU has a great quarterback who will be the primary focus of defenses and a solid offensive line. Barkley rushed for 1,271 yards last season. If Sanders stays healthy, he should top that number this year. PSU: QB Trace McSorley begins his Heisman Trophy quest and should put up some big numbers today throwing and running. 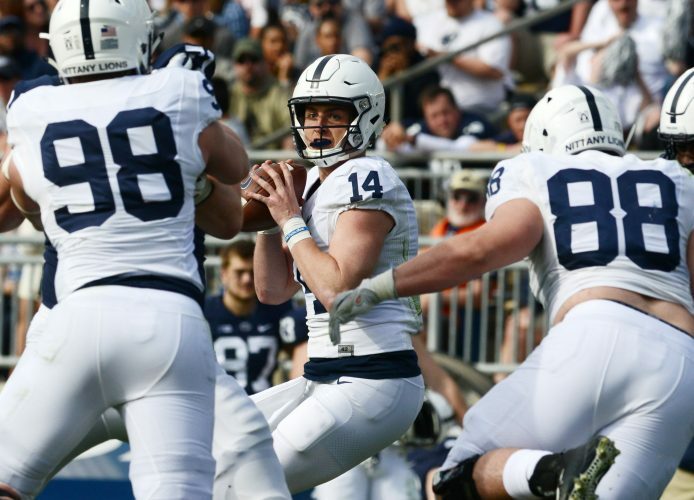 The entire season depends on McSorley staying healthy and playing well, and while he’s proven to be a tough son of a gun, he needs to try and avoid hard hits as much as possible. App State: RB Jalin Moore is a star, but the only way the Mountaineers hang around in this game will be if QB Zac Thomas has a strong day throwing the ball. Not a blowout, but Lions still win comfortably. Penn State 38, App State 16. Follow @CoryGiger on Twitter for live updates and analysis throughout today’s game.